Harmonic Meetings was recorded in Le Thoronet Abbey, whose remarkable features grace the cover of the release. The music itself; however, sprang from a traveling art exhibition called The Tent of Meetings. Hykes composed the music for this project, which was based on the sacred art of Christianity, Judaism and Islam. And for the first time, Hykes incorporated actual words into his harmonic chanting, sacred words common to those three religions, words like Hallelujah and Kyrie Fragments. Hykes says, "It is the harmonic content of the words which interests me. The harmonic content in a word can be brought to life; it comes from the same place as a pure vibration." David Hykes is a seeker, searching for the relationship between music, silence, listening and the Creation. Says Hykes, "In relation to the reverberating whole which is the Creation, man is a kind of instrument that receives and transforms impressions—a living antenna. We must find a silence that will sensitize us to the signals which are the most essential to our growth, and we must learn to listen for them.—"; Hykes finds that serenity through his harmonic chanting and that of his Harmonic Choir, the singing listeners. Hykes bases his music on the observations of Pythagoras, who twenty–five centuries ago, related note to number and sensed musical values as central to the Creation. Hykes studied the timeless geometry of the harmonic series, relating harmony in music to ordered states within oneself and the universe. But unlike many musicians who have been likewise fascinated, Hykes has explored harmonies through the most direct means, the human voice. The harmonic chanting of David Hykes springs from the tradition of the Mongolian nomads and Tibetan monks who sing "prismatically", each singer projecting harmonic overtone melodies while maintaining a steady fundamental tone. They accomplish this by an extremely precise modulation of the abdominal muscles, chest and vocal apparatus. 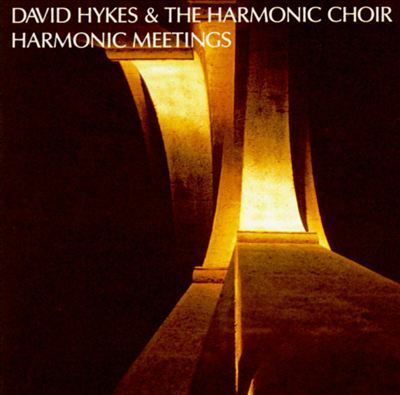 David Hykes and members of his choir can articulate from one to seven harmonics simultaneously, duplicating the precise mathematical order which underlies all sound phenomena. David Hykes has been refining his artistry for 20 years, focusing his work at the International Center for Harmonic Studies in France. His music appears in the scores of major motion pictures such as Ghost, Dead Poets Society, Jacob's Ladder, and a film about the life of philosopher and mystic Georges Gurdjieff, Meetings With Remarkable Men. Hykes has toured extensively throughout Europe, the United States, Canada, Japan and Australia. The music of David Hykes and the Harmonic Choir is a dichotomy; mystical while mathematical, meditative while intellectual. In all its complexities, it is beautiful music that flows over us and into us, freeing the soul to reach new heights of peace and understanding.